Sgt. Bowe Bergdahl To Face Court-Martial For Desertion : The Two-Way Bergdahl, who was held by the Taliban for five years after he left his base in Afghanistan in 2009, could be sentenced to life in prison. Sgt. Bowe Bergdahl will face a general court-martial for desertion. Bergdahl walked away from his outpost in Afghanistan in 2009 and was captured and held by the Taliban for five years. Sgt. Bowe Bergdahl, who was held by the Taliban for five years after he left his base in Afghanistan in 2009, could receive life in prison. 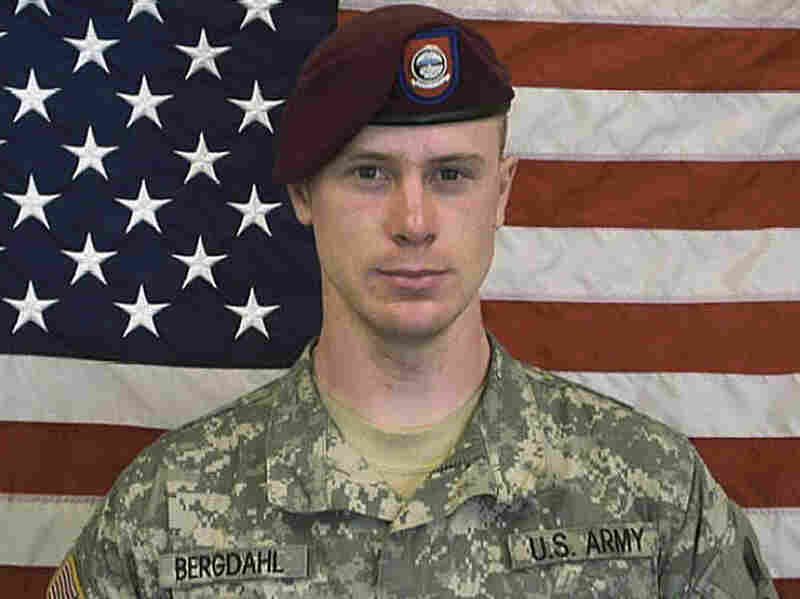 Overriding the recommended punishment by an Army officer, head of Army Forces Command Gen. Robert B. Abrams ordered that Bergdahl, now the subject of the Serial podcast, face a court-martial for desertion. "The two specific charges referred under the U.S. Armed Forces' Uniform Code of Military Justice are: (1) Article 85: 'Desertion with Intent to Shirk Important or Hazardous Duty;' and (2) Article 99: 'Misbehavior before the Enemy by Endangering the Safety of a Command, Unit or Place.'" The Army held a hearing in September to decide if Bergdahl should face a court-martial. The Army lawyer who presided over that hearing, Lt. Col. Mark Visger, sent his recommendation to Abrams, who had the final say. The New York Times reports that Visger recommended "the sergeant face neither jail time nor a punitive discharge and that he go before an intermediate tribunal known as a 'special court-martial' where the most severe penalty possible would be a year of confinement." The statement from Forces Command says that the date of the arraignment hearing will be announced later. "The charges against Sgt. Bergdahl have today been referred for trial by a general court-martial. The convening authority did not follow the advice of the preliminary hearing officer who heard the witnesses. "Lt. Colonel Rosenblatt, Captain Foster and I had hoped the case would not go in this direction. We will continue to defend Sgt. Bergdahl as the case proceeds." Bergdahl disappeared on June 30, 2009 from an outpost in Mest-Malek in Paktika Province, Afghanistan. He left the compound voluntarily and was then captured by Taliban soldiers who held him for five years. In 2014, President Obama arranged a prisoner swap for his freedom in exchange for five Taliban detainees who were being held at Guantanamo Bay. As we previously reported, the deal for Bergdahl's release has been controversial because of the circumstances surrounding his disappearance. "Some accounts had him captured during an attack on his post; others put him walking off his outpost during a counterinsurgency mission. An account in Rolling Stone implied that Bergdahl was 'ashamed to even be American' and was defecting when he was captured. "Because of that, lawmakers criticized the Obama administration for cutting a deal with the Taliban. The Government Accountability Office later found that the Pentagon broke the law during the course of the trade. "First, the GAO found that the 'Pentagon violated the Department of Defense Appropriations Act when it didn't give 30 days' notice to Congress about its plan to move the five Taliban prisoners from Guantanamo Bay.' And second, the $1 million used for the transfer 'was paid for out of an account of already-appropriated funds — a violation of the Antideficiency Act.'"